No bigger than the smallest apartment room you've ever occupied, Lahore Deli is the kind of spot that you only discover by word-of-mouth. You could easily work on that block of SoHo, walk by it twice a day, and never realize it exists -- it's that small. 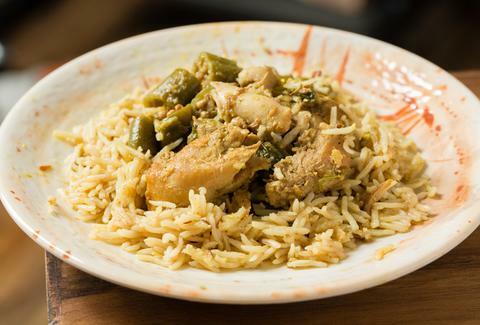 Once you do find this Pakistani counter shop, get the curried chicken with okra over rice -- it's a saucy, fragrant order of protein, with a dull heat from both the green pea-dotted rice and the chicken. If you've ever tried cooking with one of those teeny bottles of orange and green powders, take this lentil-colored meal as an example of what your final product should actually look and taste like. Speaking of, sides of lentils, chickpeas, samosas, and fried dumplings rolled in coconut shavings (gulab jaman) are also lauded by loyal customers, and should warrant return trips. Unlike the gut- and mouth-burning bomb that is the signature white and red sauce from Halal Guys -- the unofficial king of chicken & rice -- Lahore’s will satisfy your need for heat (in addition to your daily suggested serving of rice) without cutting the rest of your work day short. Michelle No is an associate staff writer at Thrillist, and has never successfully incorporated turmeric into a dish. Shoot her some tips on Twitter at @Michelle_No and Instagram at @MichelleNope.